Here’s what’s being solicited for April release in comics stores now. see Eric’s blog posts on this. PLACE YOUR ORDER AT YOUR COMICS STORE NOW! I’ve heard that from comic fans a lot over the last few years. Response to that first book was more than I ever could have hoped for. Reviews were great, fans enjoyed the work — Noel and I were thrilled. But as I started to hear that question again and again — I’ll admit, my nerves began getting the best of me. The Broadcast was my first published work. Noel had already developed a following of his own, but I was a relative unknown. Readers went into that book without any preconceived notions about me. But with a follow-up? A follow-up to a critical success? That would be different. That would bring something I hadn’t had on the first book: expectations. And expectations can be a very scary thing. So that’s probably why it’s taken this new project some time to come to fruition. Noel and I have been busy, of course. He illustrated a brilliant comic called Foster. I wrote a short Batman piece for DC and published a kids’ series on Amazon’s kindle called The Librarian. We even did a short together in Dark Horse’s Once Upon a Time Machine anthology. That said, we were both knew eventually we were going to collaborate on another full-length graphic novel — we just wanted to make sure this new project was a worthy follow-up to the first. 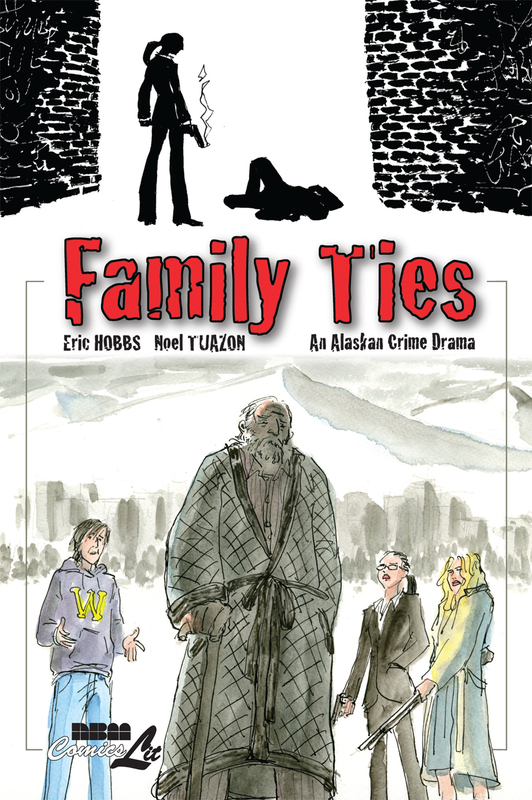 Family Ties is about an aging Alaskan crime boss with dementia who is looking to secure his family’s future by dividing his empire amongst his three heirs. His cold-hearted daughters jump at the chance to take their spot at the head of the table, but his idealistic son refuses the inheritance. Fueled by his anger, the old man disowns his son only to realize he’s made a tragic mistake when his daughters use their newfound power and influence against him. Sound familiar? It should — it is a retelling of William Shakespeare’s classic, King Lear. In school, I struggled with Shakespeare like most kids — probably more than most, actually — but King Lear always resonated with me as a timeless story that was ripe for an update. Family issues are just as common today, after all. Noel and I are still finishing up, but I’m going to do my best to get in here and post about the production of Family Ties; the struggles that come from trying to adapt Shakespeare; and how a family tragedy helped inform the book when, strangely enough, a member of my family was diagnosed with dementia shortly after I began writing the book. 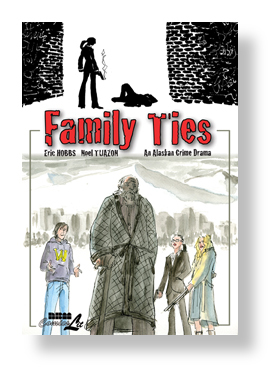 In the meantime, if you enjoyed The Broadcast, I hope you’ll take a few minutes this week to tell your local comics retailer about Family Ties. 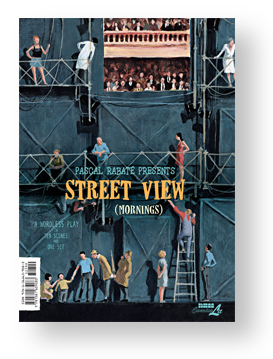 It’s available in January’s Previews and is spotlighted on page 320. 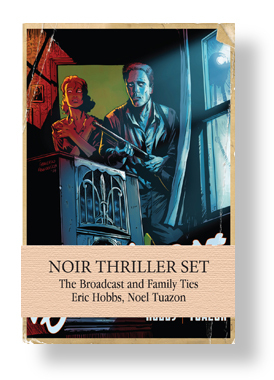 Author Eric HobbsPosted on January 6, 2013 Categories Blog, New ReleasesTags Eric Hobbs, Family Ties, Noel Tuazon, The BroadcastLeave a comment on What’s Next? 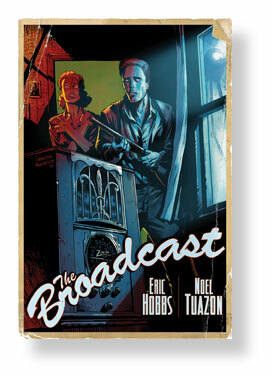 Comixology just posted The Broadcast up on their site available for download including a free 10 page preview. See the complete library of what Comixology has of our books.